This Transform Westside Summit will include a moderated Q&A between Atlanta City Council District 3 candidates Byron Amos and Antonio Brown ahead of the April 16 run-off election. The Q&A will be moderated by Atlanta Business League President and CEO, Leona Barr-Davenport. The purpose of the Q&A is to give Historic Westside neighborhood residents, community partners and other stakeholders an opportunity to hear the candidates discuss issues of specific importance to their neighborhoods. The candidates will answer questions from the moderator and attendees. The Summit is free to the public and includes a free Chick-fil-A breakfast. RSVP using the link below. One early voting poll will be open starting Monday, February 25 to Friday, March 15 from 8:30 a.m. – 5:00 p.m. at the Fulton County Government Center located at 130 Peachtree Street, SW, Atlanta 30303. Election Day is Tuesday, March 19, 2019. 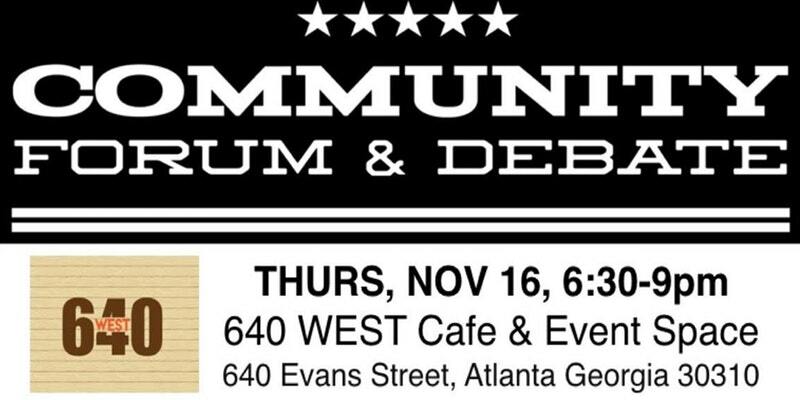 The NPUs of Atlanta City Council District 3 present The Final Forum featuring questions from you! To submit questions for the candidates, send your name, neighborhood and question to ATLDistrict3forum@gmail.com. Neighbor to Neighbor, Let's Chat! Many issues are important to the well-being of Atlanta and specifically to District 3, such as transportation, housing, education & economic development, neighborhood planning & development, social justice, and the Atlanta Beltline. Historic Westin Heights/Bankhead and Atlanta Suburban Alumnae Chapter of Delta Sigma Theta Sorority, Inc. are organizing a community discussion between the qualified candidates for the special election of Atlanta City Council District 3: Byron Amos, Antonio Brown, Ricky Brown, Matthew Charles Cardinale, Greg Clay, Patricia Crayton, Erika Estrada, Mesha Mainor, Jabari Simama, Shalise Young. Join the League of Women Voters Atlanta Fulton County for community building and discussion between the qualified candidates for the special election of Atlanta City Council District 3. The Friendship Forum Ministry presents Atlanta City Council District 3 Candidate Forum. School Board Candidate Forum at Drew Charter School. The Movement Ink, L.E.A.R.N.global, Action Network of Atlanta, and 640 WEST will host a Community Forum and Debate for Candidates on Thursday, November 16, 2017. The Atlanta Press Club Loudermilk-Young Debate Series will host runoff debates for the offices of mayor of Atlanta and city council president on Thursday, November 16, 2017 at Public Broadcasting Atlanta. The mayoral debate will be taped at 10:00 a.m. on November 16th at PBA30 and will stream live via www.fb.com/TheAtlantaPressClub and on www.wabe.org. Invited candidates to participate in the mayoral debate include Keisha Lance Bottoms and Mary Norwood. The debate for city council president will stream live via www.fb.com/TheAtlantaPressClub on November 16th at 11:30 a.m. Invited candidates to participate in the debate for city council president include Felicia Moore and Alex Wan. Join us for a mayoral forum like no other with interactive activities to help you understand candidates' knowledge of our local government, their ideas on community engagement, and much more! You can read our “job description” for the Mayor here and check out all our local voter information at voteatl.org. There are many opportunities for you to help shape this event - starting with a quick RSVP. This event is free and open to the public but seating is limited. Please reserve your seat today. We are also looking for some stellar volunteers to help us make sure this forum is a big success. Sound like you? Just go to civicatlanta.org/volunteer to get started. This event will be televised live on WSB TV Channel 2. 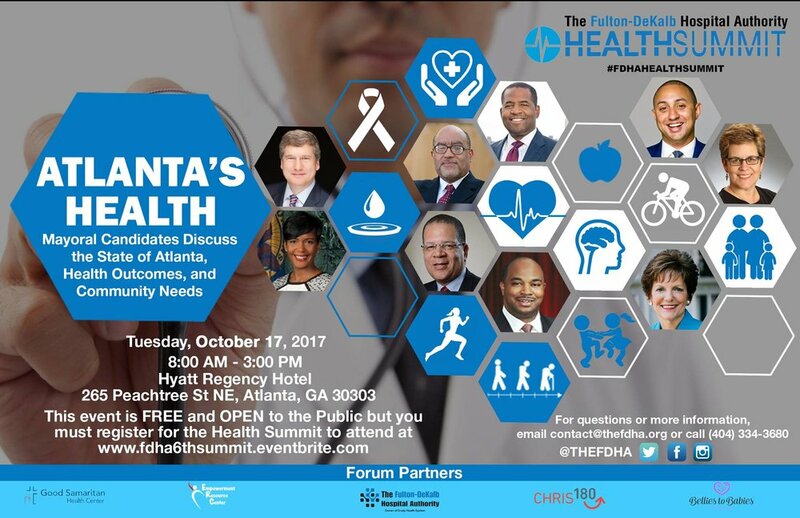 The top six candidates running to be the next Mayor of Atlanta will address questions posed by the Buckhead Council of Neighborhoods and moderated by Jim Galloway of the Atlanta Journal-Constitution. Swing by CCI for a special #VoteLocal happy hour on Oct. 16th. Come have a beer, grab a snack, meet the team and learn how you can help get out the vote this Nov. 7th. This year the City of Atlanta will elect a new mayor, city council, and school board. These positions and the people who fill them will shape the future of Atlanta, so come out, get informed, and take the pledge to get your friends, family, and neighbors to the polls.